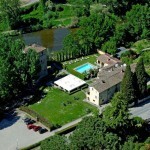 Complex in Umbria consisting of a hamlet which has been restored plus olive grove, vineyard and woodland. 5 apartments giving 14 bedrooms. 2 main building with 5 apartments giving 14 bedrooms plus a small private church. 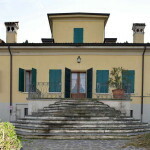 The main building has a total surface of 715 square metres and is divided into three main apartments, plus one for caretakers. The first unit has a total surface of 455 square metres and is disposed on three levels, composed as follows. Ground floor: entrance, two living rooms, kitchen, veranda, wc, cellar and staff quarters with: porch, kitchen, bedroom, vestibule, bathroom. First floor: entrance, double living room and terrace. Second floor: office, four bedrooms with bathroom and sitting room. Apartment of 120 square metres located on the first floor with: terrace, kitchen, living room, two bedrooms and two bathrooms. Apartment of 140 square metres disposed on two levels and composed as follows. Ground floor: cellar, bedroom, bathroom. First floor: living room, kitchen, bedroom and bathroom. This building has a total surface of 230 square metres and is disposed on two levels, linked between an external staircase. Apartment of 160 square metres, located on the ground floor, composed as follows: living room, three bedrooms, three wc, two vestibules and terrace. Apartment of 70 square metres, located on the first floor with: kitchen, living room, vestibule, two bedrooms and two bathrooms. The property is completed by a small consecrated church of 60 square metres with bell tower and internal fresco, underground garage with two car ports of 100 square metres and technical room with power oscillator with automatic start. The surrounding land has a total surface of 10.8 hectares of land, with four hectares of vineyard and olive grove, and 6.8 hectares of woodland. 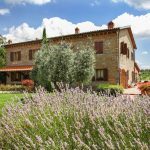 FEATURES Old brick and stone construction, terracotta flooring, ceilings with wooden beams and terracotta tiles, old stone fireplaces, brick-built arches, built-in kitchen, exposed stone, private terrace, loggia, pergola, conservatory, wood burning oven, private chapel. 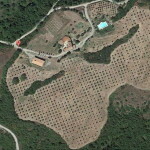 LAND 10.8 hectares, four of which are cultivated as olive grove and vineyard, while the remaining part is woodland. Bedrooms: 14 Bathrooms: 13 Plot Size: 108000 m² Living Area: 1100 m² Parking: Garage Heating: Radiators Property: Old brick and stone construction, terracotta flooring, ceilings with wooden beams and terracotta tiles, old stone fireplaces, brick-built arches, built-in kitchen, exposed stone, private terrace, loggia, pergola, conservatory, wood burning oven, private chapel.